We are dedicated to the preservation of Villa Rica’s rich and unique history of gold mining. The lure of gold attracted Americans to this area in the very earliest days of industrial gold mining. We are Georgia’s only gold museum that is located on an actual gold mine with gold and gem panning on-site. In fact, gold is regularly found on Pine Mountain to this day! Our beautiful 4,800 square-foot museum houses many exhibits of artifacts used to mine gold right here on Pine Mountain or in the hills surrounding Villa Rica. In addition to gold mining artifacts the museum contains regional artifacts. Some of these regional artifacts date back as far as 12,000 BC. 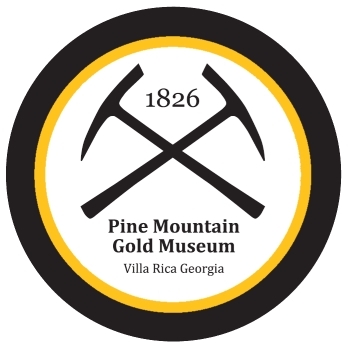 The typical museum tour begins with an 18-minute documentary detailing the history of gold and the Villa Rica mines. ATTENTION!!! OUR MUSEUM TOUR IS CURRENTLY SHUT DOWN WHILE WE REFURBISH, RESTORE, AND EXPAND OUR EXHIBITS. CONSTRUCTION SHOULD BE COMPLETE BY EARLY MARCH 2019. PLEASE BEAR WITH US AS WE UPDATE OUR FACILITIES TO BETTER SERVE YOU!